There is such a negative stigma with identifying yourself as pro-life, more so than with pro-choice. If you are pro-life, then you don’t care about women. If you are pro-life, you must be a crazy religious fanatic, who only cares about the unborn baby until it’s born. If you are pro-life, you must be behind on the times, because it’s the 21st century, and every woman should have the right to choose what she does with her body. It makes me think, in a society that is fighting so hard to beat stigmatizing groups of people, why are we not fighting to undermine these ones? When I came to Turning Point, I was undecided if I actually wanted to work with these women, because of all the preconceived notions I had of them. My mom told me to try it out, and if anything, it would be good experience to put on my resume. As I began my internship, I realized how wrong I had actually been, and how misinformed many women in my generation are. Working for Turning Point has opened my eyes that the real power for a woman lies in her power to choose life. I consider myself a feminist. The feminist movement is all about the strength that women have, and the fact that women are strong enough to deal with whatever life throws their way. So why is that not applied to an unintended pregnancy? 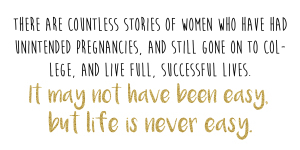 There are countless stories of women who have had unintended pregnancies, and still gone on to college, and live full, successful lives. It may not have been easy, but life is never easy. Turning Point has opened my eyes to the fact that many women aren’t being allowed to voice their true wants and desires about an unintended pregnancy, without being bombarded and pressured by the other options they have. Many women have said that Turning Point became their safe haven, and in the short time I have been here, I have actually seen that in action. I have learned so much about compassion and strength from working at Turning Point. From every woman who decides to show true feminist power and carry to term their unintended pregnancy, to the women I work with who always have time for a person in need. I have also learned so much about myself in this time. I have found a category that I don’t need to add a “but…” or “only if…” to, and I feel comfortable telling anyone and everyone about it. I am a 22-year-old woman, I am a feminist and I am life-minded.